Lush, the beauty brand that single-handedly launched the world's obsession with bath bombs, brought fresh, handmade cosmetics to the mainstream, and sits like a beacon in shopping malls all over America wafting out the most clean and delicious scent, is back in the news today. Yeah, you could say we're fans of the brand. Clearly. The brand just launched a new and exciting campaign. In the past, Lush's campaigns have centered around animal and human rights, and this one follows suit. It's called the Trans Rights Are Human Rights campaign, and it's designed to bring awareness to all the social and political discriminations that trans people still face. It's also meant to offer support through donations to specific organizations looking to secure and advance transgender rights. All you have to do to back them up is to purchase the brand's newest product, which was launched specifically for this campaign. It just hit shelves today (both in-store and online). It's a new heart-shaped bath melt, and 100% of the proceeds from each sale will be donated. 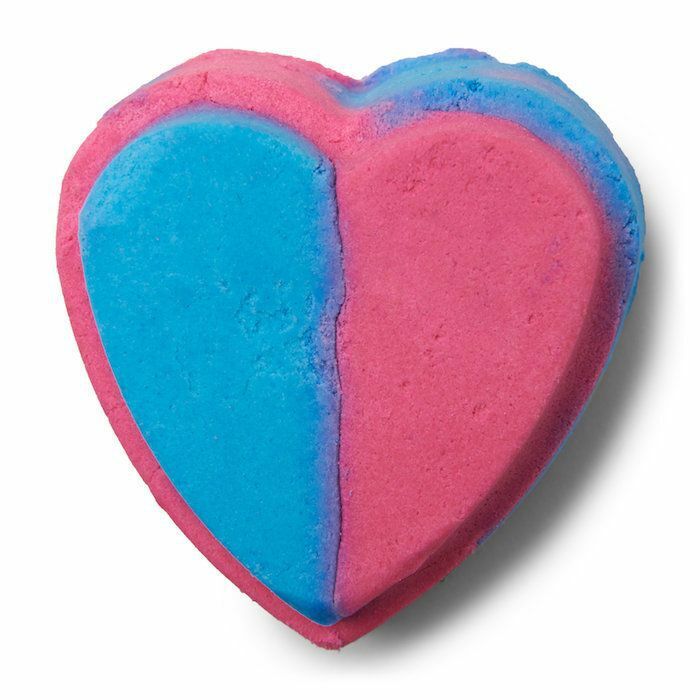 The new product is this pink and blue heart-shaped bath melt. If you purchase it, 100% of the purchase price will go directly to the National Center for Transgender Equality, the Canadian Centre for Gender and Sexual Diversity, and other similar transgender support organizations. It's made with organic cocoa butter, almond oil, bergamot oil, and Brazilian orange oil. Simply drop it into a bathtub full of warm water and the natural oils and butters will melt down to moisturize and nourish your skin. Like all other Lush products, it's vegetarian, it's formulated with ingredients that are ethically sourced, and it's not tested on animals. The brand is looking to reach a goal of $450,000 over the course of the campaign. Again, all you need to do to help is to purchase a bath melt for yourself (or one for each one of your friends). The brand aptly named it the "Inner Truth," because it supports all identities. The brand is also showing this symbolically by switching up the storefront displays on all 250 retail stores across the nation. Instead of the bright and cheerful aesthetic we're used to seeing, we'll see dark windows that are dressed down, complete with quotes about identity and transgender rights straight from Lush employees themselves. Head over to Lush's website to see more information about the new product and campaign. You'll even find a user-friendly webpage dedicated to providing articles and information about the trans community, along with a guide to showing support and becoming an ally.